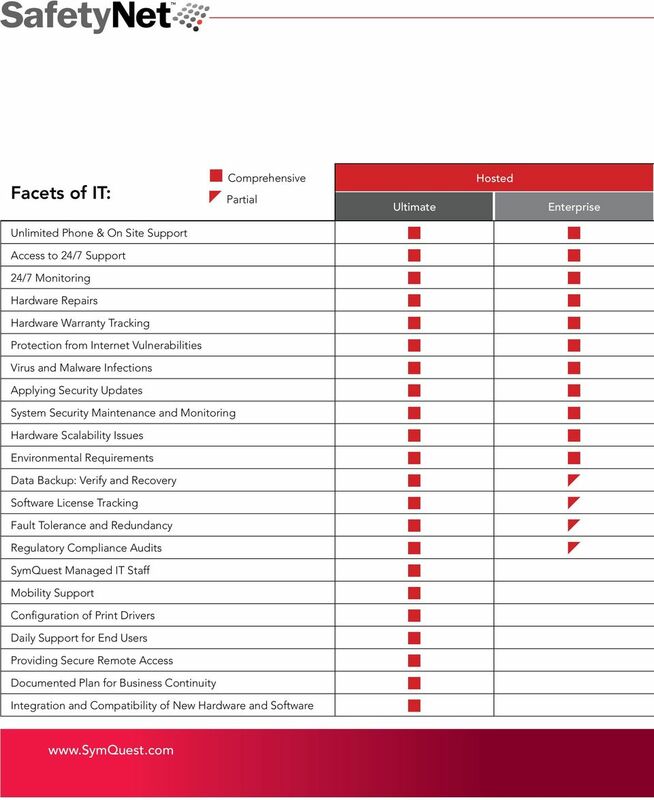 Download "IT Management Options. Security Redefined. Flexible Offerings. Peace of Mind"
8 O Garde! Like a stitch i time, Guardia provides warigs before it s too late. 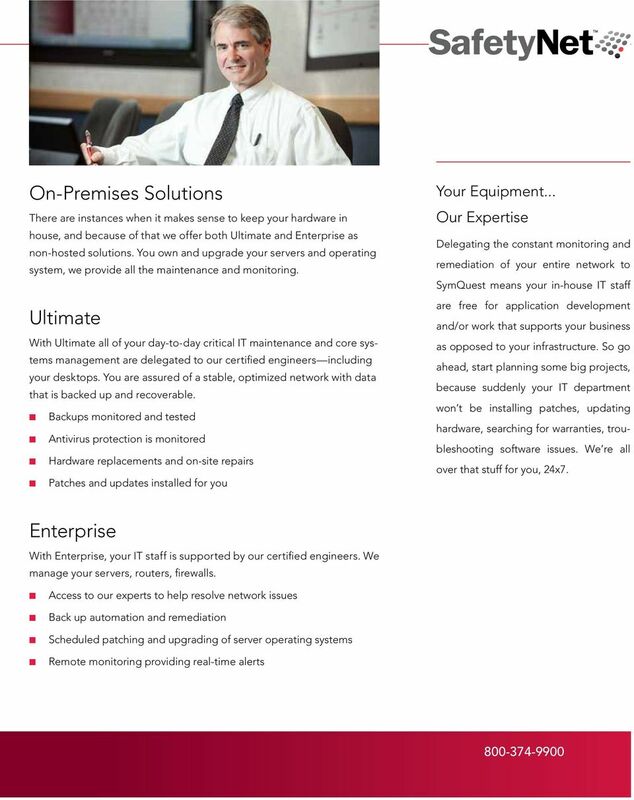 Whe the warig is beyod i-house capabilities we cotiue to support you with Priority Respose Times Advataged Rates Guardia SymQuest uses advaced software to moitor our critical systems, ad ow you ca, too. 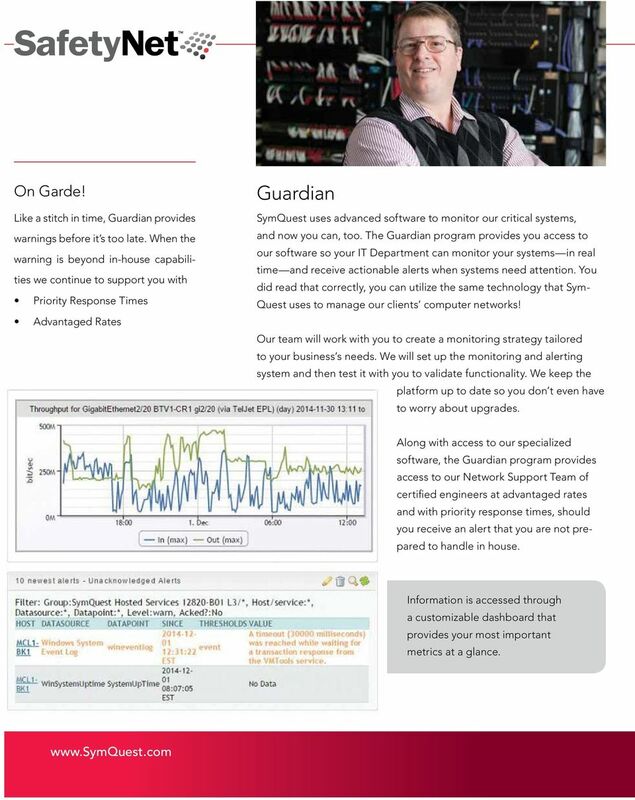 The Guardia program provides you access to our software so your IT Departmet ca moitor your systems i real time ad receive actioable alerts whe systems eed attetio. 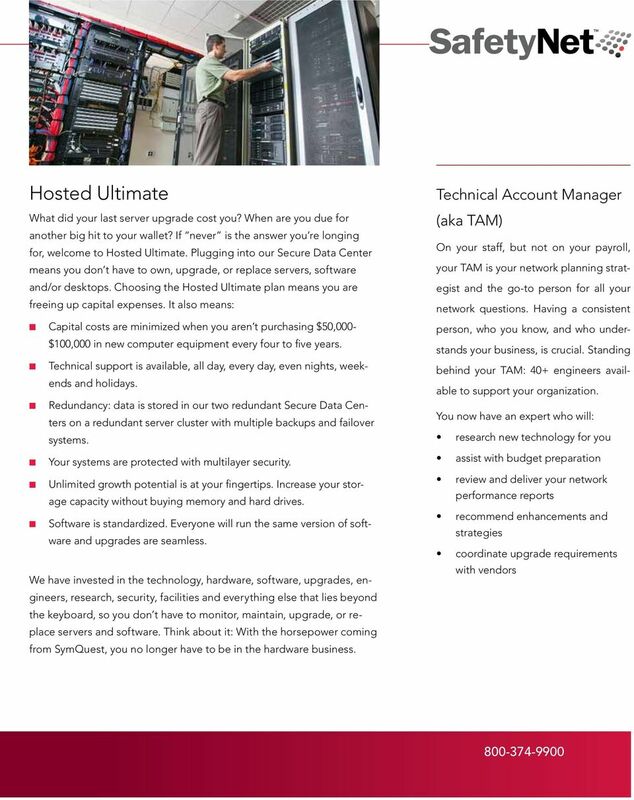 You did read that correctly, you ca utilize the same techology that Sym- Quest uses to maage our cliets computer etworks! Our team will work with you to create a moitorig strategy tailored to your busiess s eeds. We will set up the moitorig ad alertig system ad the test it with you to validate fuctioality. We keep the platform up to date so you do t eve have to worry about upgrades. 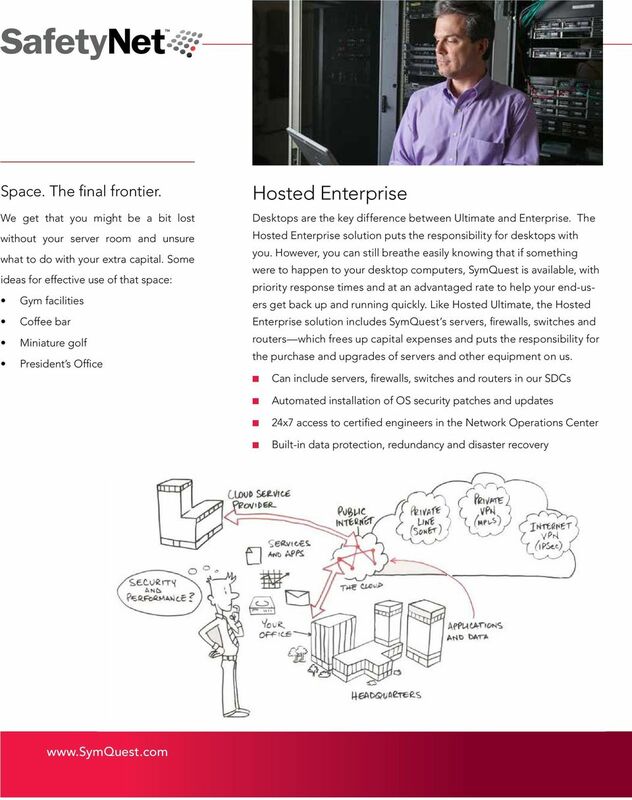 Alog with access to our specialized software, the Guardia program provides access to our Network Support Team of certified egieers at advataged rates ad with priority respose times, should you receive a alert that you are ot prepared to hadle i house. Iformatio is accessed through a customizable dashboard that provides your most importat metrics at a glace. 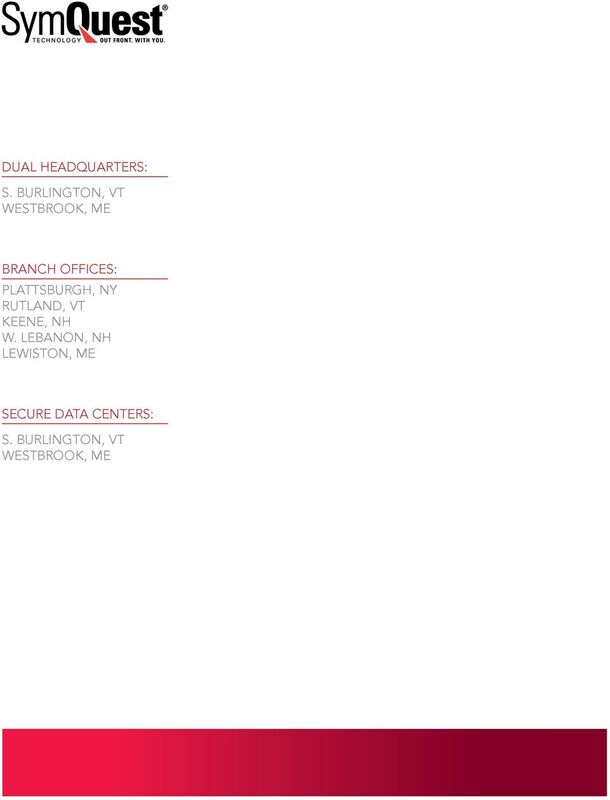 10 Be Compliat Not Complacet: SymQuest Data Protectio maitais full compliace with the followig regulatios: Sarbaes-Oxley (SOX)/ SSAE-16 Type II HIPAA Graham-Leach-Bliley (GLBA) Paymet Card Idustry (PCI) Safe Harbor FERPA-Educatioal Records FINRA Data Protectio Aside from your people, what is your compay s most valuable asset? Data. 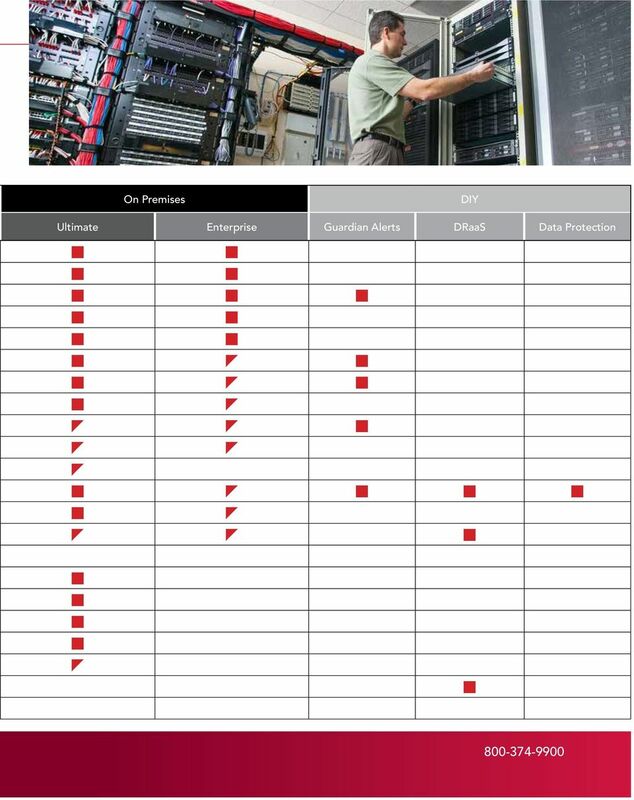 Are you usig the most reliable back up systems available to protect your most valuable asset? Half of the compaies out there are usig outdated back up systems like tapes. Certaily, tape back ups were state-of-the-art techology just five years ago. But like everythig techology, the advaces are comig at light speed, ad at SymQuest we are takig advatage of the best solutios as they come out. Toss your tapes. 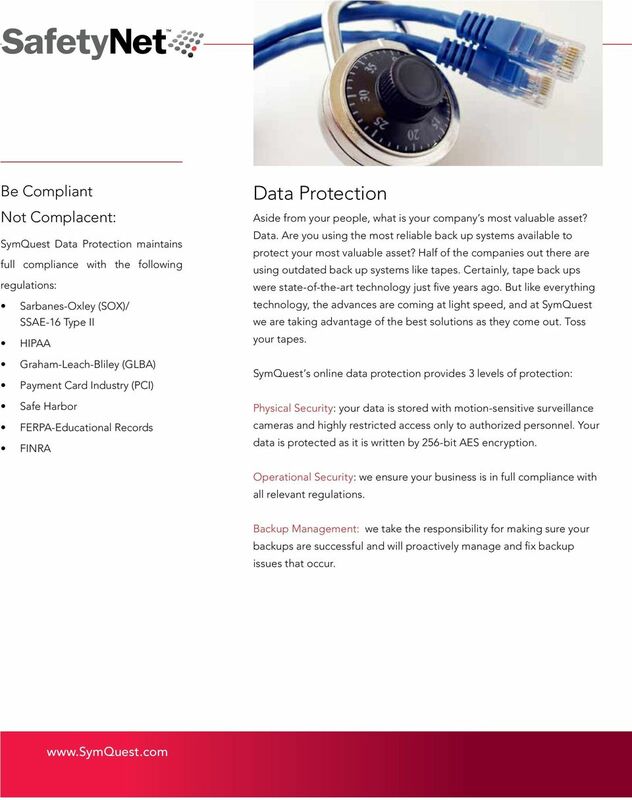 SymQuest s olie data protectio provides 3 levels of protectio: Physical Security: your data is stored with motio-sesitive surveillace cameras ad highly restricted access oly to authorized persoel. Your data is protected as it is writte by 256-bit AES ecryptio. 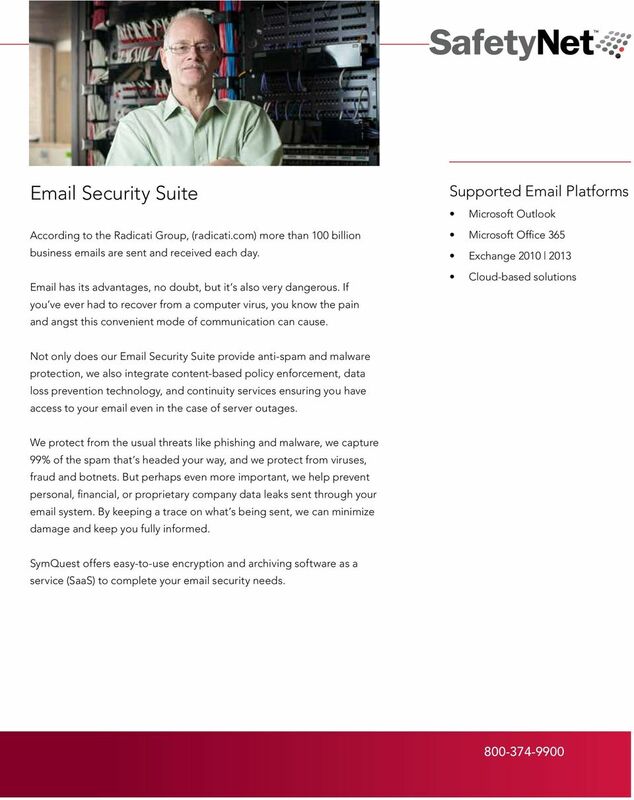 Operatioal Security: we esure your busiess is i full compliace with all relevat regulatios. 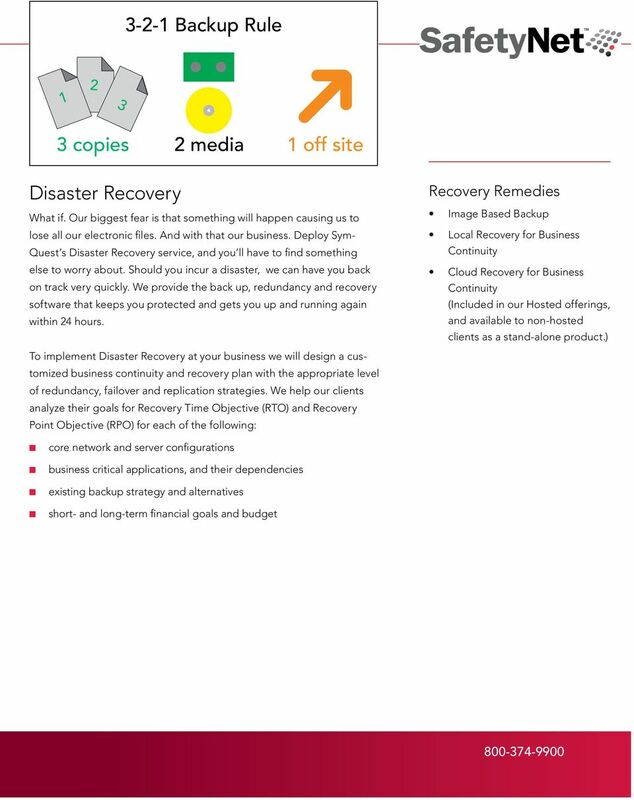 Backup Maagemet: we take the resposibility for makig sure your backups are successful ad will proactively maage ad fix backup issues that occur.